Honoring "short attention spans" everywhere, Main Street Theatre Works presents our 3rd Annual One-Act Festival.. This three-day-only fundraising event features some of your favorite MSTW actors ~ Allen Pontes, Julie Anchor,Georgann Wallace, Cynthia Drumbor, Brandon Rapozaand Carissa Meagher, to name a few, plus others new to the company. In just 90 minutes, you'll see these talented actors perform 9 different one-act plays, including several written by Sacramento playwrights Leo McElroy, Jeri Weiss and Allen Pontes, as well as Amador County's own Sarah Armstrong. This fundraiser helps to set the stage for their upcoming Summer Season at the Kennedy Mine Amphitheatre. For performance information, see Performance Dates and Times at left. Tickets are $25 each and include dessert, your choice of coffee or tea, and the show. And there will be a no-host wine bar on Friday and Saturday nights. Win One of Two Exciting Destination Getaways! Also, as part of their fundraising efforts, MSTW will be holding a raffle giving away lodging at two different scenic locations. First, a beautiful condo at the Lake Tahoe Vacation Resort, on the lake at the corner of Ski Run Blvd and Hwy 50. The condo has one bedroom and a full kitchen, and access to a variety of amenities including a pool, Jacuzzi, sauna, full bar, restaurant and more. Accommodations are for two nights,Sunday through Thursday. The second raffle prize is a two-night stay in a private home inWawona, a private property surrounded by Yosemite Park. The house has 4 bedrooms, 2 baths and sleeps 10, and this prize is valued at over $1,000. Raffle tickets will be sold at the 3-day "Weekend of One-Acts" event, or can be purchased from a MSTW board member. Raffle ticket holders need not be present to win. summer's smash hit, The Golden State, takes a comical stab at this horror classic. While Wilson's play will keep you on the edge of your seat, it's not because you're dying of fright, but because you'll be dying of laughter. The San Francisco Examiner says, "An evening of exhilarating entertainment...An inventive, original comedy of horrors." 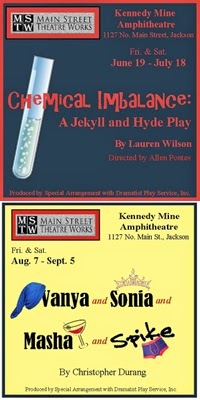 Chemical Imbalance: A Jekyll and Hyde Play runs every Friday andSaturday, June 19th - July 18th. Here's a chance for you to explore your creative side! Main Street Theatre Works is offering a Set/Costume Design Workshop on Tuesday, March 24th from 9 a.m. to 4 p.m. We'll start with a meet and greet coffee time and then explore set design and decorative painting. Our Artistic Director and winning set designer will talk about the basics of set design and our scenic artist extraordinaire, Carol Sethre, will do a fun, hands-on demonstration on some of the more common painting techniques used in set design. We'll break for a light lunch, provided by MSTW, and then our Costume Designer and Wardrobe mistress, Nancy Street, will discuss the basics of Costume design. Everyone will have an opportunity to try their hand at a simple design board. It should be a fun learning experience and a great way for you to add to your artistic theatre sensibilities. The workshop will be held at the Coldwell Banker Banquet Room at 846 Highway 88/49. Take the driveway all the way to the bottom and the room is to the right of the outdoor staircase. Please RSVP to Susan McCandless (susanmccandless@hotmail.com) by March 16th. We look forward to seeing you there! 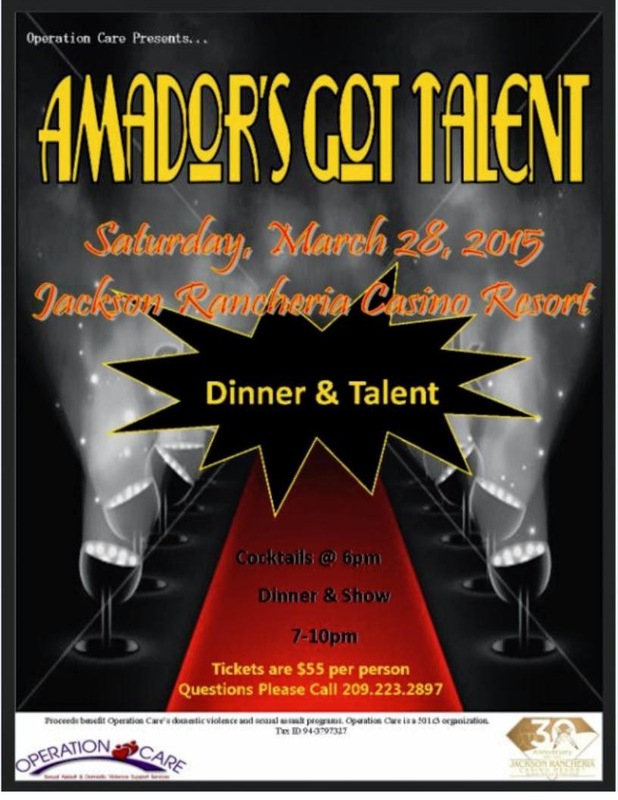 The non-profit arts agency AmadorArts has announced that it has just received a $1,000 contribution from the Jackson Rancheria and $500 from Hensel Phelps Construction Company, one of the largest general contractors and construction managers in the United States. The latter is on a local project and asked the Ione Business and Community Association for recommendations. In accepting the two donations, Executive Director of AmadorArts Terra Forgette says “The arts community will get a boost in programming and promotion as a result. We are very grateful.” She further explains that when the organization applies to the State for grants, they must be financially matched. “When that required amount is around $15,000, these kinds of contributions, along with memberships and fundraisers, mean a lot." AmadorArts, which is short for Amador County Arts Council, has been serving the cultural needs of Amador County since 1982. The two most familiar and prominent programs include Arts Education for local schools and others in the community, and the free summer concerts called TGIF. Many other activities promote other arts groups and local artists, and they include the AmadorArts Gallery, Art Trek, mini-grants, scholarships, and currently, the River Reflections Mokelumne River Arts Project. Volunteers make all the difference, adds Forgette. Learn more at www.amadorarts.org. The office/gallery of AmadorArts is located in Sutter Creek. Terra Forgette is the Executive Director. Americana star’s tour stops in California’s smallest incorporated town. 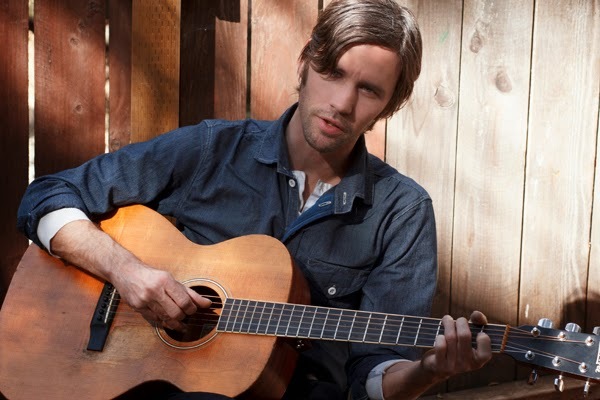 Friday, March 20 at 8 p.m.and Saturday, March 21 at 7 p.m. Willie Watson returns to Feist Wines in Amador City. 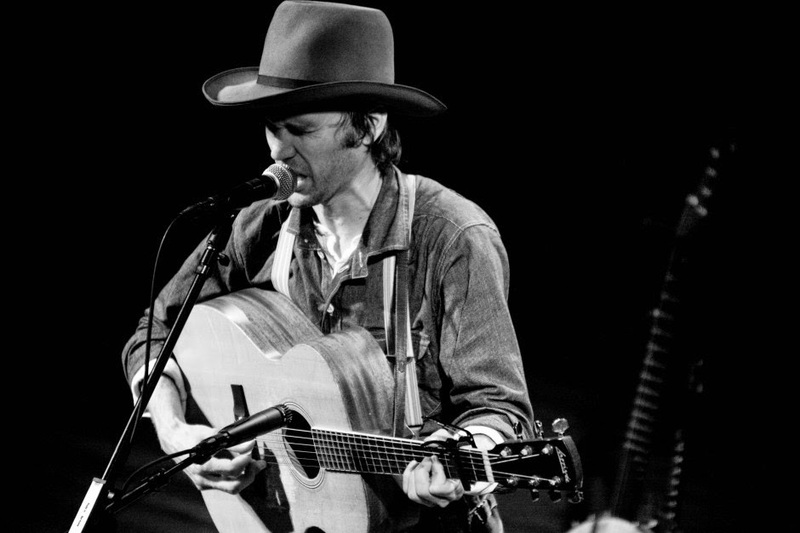 His first show at Feist in January sold out two weeks ahead of time and the at capacity tasting room was filled with soulful Americana music. Watson quit high school in 1997 to pursue his musical career. He is a folksinger, multi-instrumentalist (guitar, banjo, harmonica), and sometimes songwriter. Growing up in Watkins Glen, New York, Watson listened to his father's record collection, which included artists like Bob Dylan and Neil Young, as well as Lead Belly, he later discovered Harry Smith's Anthology of American Folk Music — which helped trigger the folk music revival of the 1950s and 60s. These artists informed the style and substance of the traditional and old-time music Watson makes on his own. He was one of the founding members of the Old Crow Medicine Show, a quintet that specialized in a traditional American string band sound and had left-field platinum success with a revamped Bob Dylan song, "Wagon Wheel," in the late '90s, recording and touring with the group for some 17 years before leaving to go solo in 2011. He released his debut solo album early in 2014 on Rawlings and Gillian Welch's Acony Records imprint. Of his transition to a solo career, Watson notes, "I don't have any regrets, but I'm really happy that I'm where I'm at now. I'm playing the music I want to play, and it's real simple, and I don't have a big light show–I'm in a good place with that." Tickets are $25 for general admission and are available at feistwines.com. 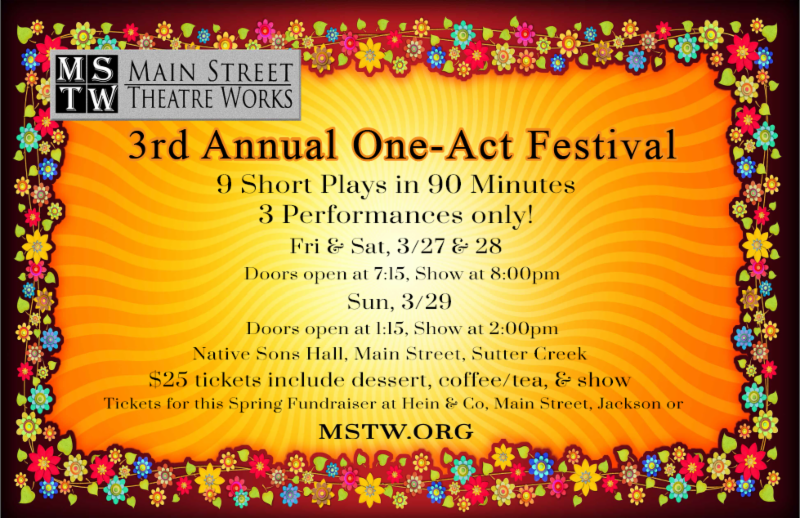 Jackson, CA (February 14, 2015) – Honoring “short attention spans” everywhere, Main Street Theatre Works presents their 3rd Annual One-Act Festival. This three-day only fundraising event features some of your favorite MSTW actors ~ Allen Pontes, Julie Anchor, Georgann Wallace, Cynthia Drumbor, Brandon Rapoza and Carissa Meagher, to name a few, plus others new to the company. 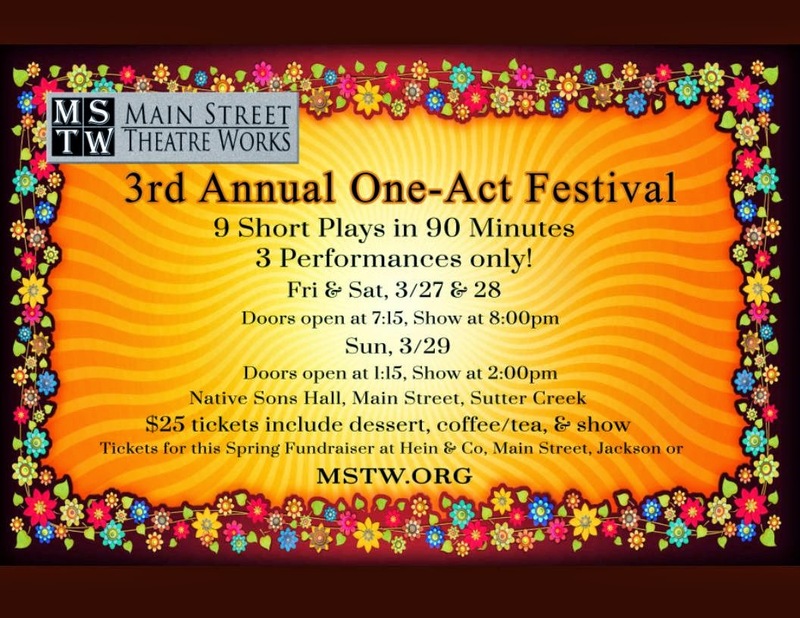 In just 90 minutes, you’ll see these talented actors perform 9 different one-act plays, including several written by Sacramento playwrights Leo McElroy, Jeri Weiss and Allen Pontes, as well as Amador County’s own Sarah Armstrong. This fundraiser helps to set the stage for their upcoming Summer Season at the Kennedy Mine Amphitheatre. The One-Act Festival is March 27th, 28th, and 29th at the Native Sons Hall in Sutter Creek. There are two evening performances ~ Friday and Saturday, March 27th & 28th, ~ with doors opening at 7:15pm for dessert, show starting at 8pm. There is also a matinee performance on Sunday, March 29th, with. doors opening at 1:15 for dessert, and the show starting at 2:00pm. Tickets are $25 each and include dessert, your choice of coffee or tea, and the show, plus there will be a no-host wine bar on Friday and Saturday nights. Also, as part of their fundraising efforts, MSTW will be holding a raffle giving away lodging at two different scenic locations ~ A beautiful condo at the Lake Tahoe Vacation Resort, on the lake at the corner of Ski Run Blvd and Hwy 50. The condo has one bedroom and a full kitchen, and access to a variety of amenities including a pool, Jacuzzi, sauna, full bar, restaurant and more. Accommodations are for two nights, Sunday through Thursday. The second raffle prize is a two-night stay in a private home in Wawona, a private property surrounded by Yosemite Park. The house has 4 bedrooms, 2 baths and sleeps 10, and this prize is valued at over $1000. Raffle tickets will be sold at the 3-day “Weekend of One-Acts” event, or can be purchased from a MSTW board member. Raffle ticket holders need not be present to win. MSTW is excited about kicking off their 12th season at the beautiful Kennedy Mine Amphitheatre, in the heart of Jackson. This summer’s season begins with Chemical Imbalance: A Jekyll and Hyde Play ~ a warped and comedic retelling of Robert Louis Stevenson’s Strange Case of Dr. Jekyll and Mr. Hyde, written by Lauren Wilson, who wrote last summer’s smash hit, The Golden State. Our second show is Christopher Durang’s Tony Award winning Vanya and Sonia and Masha and Spike, a hilarious spoof on several of Chekhov’s best known characters, but you don’t need to be a Chekhov fan to enjoy this zany comedy. We look forward to another wonderful Summer Season and are sharing our talents at the One-Act Festival. Purchase your tickets today for our Spring Fundraiser, as seating is very limited. The price of admission includes not only the show, but some fabulous desserts, tea/coffee, and the joy of knowing you’re supporting one of Amador County’s best professional-quality theatre companies. For more information and to purchase tickets to this Limited Engagement Event, visit the MSTW website at www.mstw.org. Tickets are guaranteed to sell out, so get your tickets today! Main Street Theatre Works (MSTW) is pleased to announce its 2015 Summer Season at the Kennedy Mine Amphitheatre in Jackson, starting with Chemical Imbalance: A Jekyll and Hyde Play ~ a warped retelling of Robert Louis Stevenson’s Strange Case of Dr. Jekyll and Mr. Hyde. Lauren Wilson, who wrote last summer’s smash hit, The Golden State, takes a comical stab at this horror classic. While Wilson’s play will keep you on the edge of your seat, it’s not because you’re dying of fright, but because you’ll be dying of laughter. The San Francisco Examiner says, “An evening of exhilarating entertainment…An inventive, original comedy of horrors.” Chemical Imbalance: A Jekyll and Hyde Play runs every Friday and Saturday, June 19th - July 18th. Rounding out MSTW’s season will be Vanya and Sonia and Masha and Spike. Written by Christopher Durang, Vanya and Sonia and Masha and Spike is the winner of the 2013 Tony Award for Best Play, as well as numerous other industry awards. A hilarious spoof on several of Chechov’s best known characters, but you don’t need to be a Chechov fan to enjoy this zany comedy. Vanya and Sonia live in a quiet farmhouse where they grew up, but their peaceful life is turned upside down when their movie star sister, Masha, returns unannounced with her new boy toy, Spike. “Riotous! The kind of full-on comedy that’s rare on Broadway!” says The New York Post. Vanya and Sonia and Masha and Spike runs August 7th – September 5th. Main Street Theatre Works is a professionally oriented theatre company, performing in the heart of Amador County. Now entering its 21st season, MSTW continues to be dedicated to bringing professional and community theatre artists together to produce classical and contemporary plays, striving for a balance that stimulates both artists and audiences. Tickets are now on sale and going fast! Join us for a fun-filled evening...reserve your seats today! This year’s concert features the music of Richard Strauss. An important transitional figure between the nineteenth and twentieth centuries, Strauss is well-known for his lushly orchestrated symphonic tone poems (a free-flowing orchestral piece inspired by literature or nature) and for his many operas. Perhaps his best-known work is Also Sprach Zarathustra which served as the soundtrack for the landmark film of Stanley Kubrick, 2001: A Space Odyssey. The Friends of Music Orchestra opens the program with one of Strauss’ most important works, the tone poem Tod und Verklärung, or Death and Transfiguration. The music movingly depicts the death of an artist. As the man lies dying, thoughts of his life pass through his head: his childhood innocence, the struggles of his manhood, the attainment of his worldly goals. At the end, he receives the longed-for transfiguration "from the infinite reaches of heaven". The program continues with the joyful Festmarsh (Festival March), one of the composer’s earliest works. The remainder of the program highlights the composer’s life-long love affair with the human voice, particularly the soprano voice. Two beautiful songs, Morgan and Cäcilie, come from his set of Lieder for voice and orchestra. The concert concludes with the epochal last scene from the composer’s last opera Capriccio, completed in 1942, which, in passages of great beauty, offers a summation of the composer’s musical outlook and legacy. The soprano soloist is Alexis Magarò. Magarò is a native Californian who received a degree in English and Italian literature from the University of California at Santa Cruz, where she was also one of the star performers in its opera program. She then immediately moved to Florence, Italy where she studied voice with soprano Jolanda Meneguzzer and the conductor Bruno Rigacci. Having distinguished herself in a series of vocal competitions in Italy and the United States, Magarò made her opera debut in Innsbruck, Austria in “Il Tito” by Antonio Cesti under the baton of famed baroque specialist, Alan Curtis. Performances were aired live on radio and television throughout Europe, leading to a position as principal soloist at Opernhaus Halle in Händel’s birthplace. There she sang a variety of roles ranging from Violetta to Mélisande, Tatjana, Vitellia, and Queen of the Night. She subsequently made her home in Berlin and then Paris, accepting engagements throughout Europe and perhaps most frequently in Prague where she was repeatedly called upon as Mozart’s Donna Anna. A dramatic coloratura, Ms. Magarò has appeared frequently on television and often been the subject of radio broadcasts with both live and recorded performances of everything from Mozart to Puccini, Richard Strauss and Villa-Lobos. She currently resides in Chicago. Henrik Jul Hansen returns as conductor of the Orchestra of the Mother Lode Friends of Music. A native of Denmark, Hansen received his training at several prominent European conservatories, including those of Stockholm and London. His debut in the United States was at Carnegie Hall in New York City, under the patronage of the Queen of Denmark. 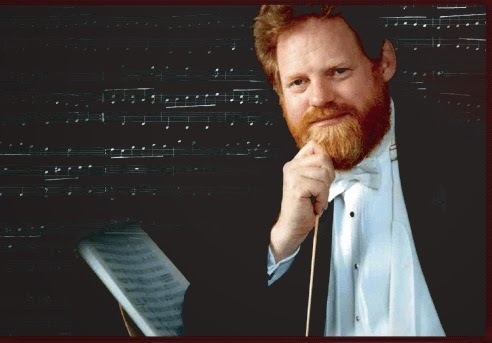 Hansen has resided in California over the past two decades where he has served as conductor of the Sacramento Ballet, the Merced Symphony and other regional orchestras. The Orchestra of the Mother Lode Friends of Music has evolved to become the premier orchestral ensemble in the Sierra foothills. Its repertoire ranges from Haydn and Mozart to contemporary Latin American music. The upcoming concert of music by Richard Strauss will be performed by one of the largest ensembles ever put together by the organization, with some 58 players, including four acting concertmasters from sister orchestras from throughout Northern California. The majority of the orchestra’s personnel remain long-time associates who reside in the Mother Lode counties. Tickets to the concert are $20 for adults, and may be purchased at Mother Lode Music in Martell or the offices of the Calaveras County Arts Council on Main Street in San Andreas, or at the door. In a special promotion to encourage young people to appreciate classical music, admittance of children under the age of 18 will be without charge. For more information, go to the organization’s web site www.mlfm.org or call (209) 293-4227.